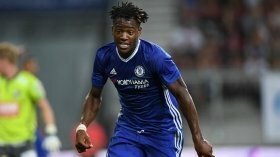 Michy Batshuayi to remain with Chelsea? Chelsea could find themselves frustrated in their bid to offload Michy Batshuayi with the Belgian said to demand substantial wages to seal an exit. The Belgium international recently returned from an unsuccessful loan stint with Valencia but he appears to have no future under the guidance of Maurizio Sarri. As such, he has been widely fancied to leave the west London side before the transfer deadline but that seems unlikely to happen with the suitors being put off from lodging an offer. According to Sky Sports News, both West Ham United and Real Betis are keen on landing the Belgian on a permanent basis but they are unwilling to match the player's own demands for a £160,000-a-week contract. Everton, on the other hand, are willing to match the player's salary package but they are said to hold concerns regarding the £35m valuation for a marksman, who has struggled for form over the past six months.